Joy Creek Photo Archive (c) all rights reserved Purple accents the long, terminal flower stems and is echoed in the rosy tones of the half-inch flowers. Over-all, the flowers appear fluffy as the white stamens become pronounced once the yellow pollen has disbursed. The pinnate leaves are composed of small leaflets that add to the airy appearance of this herbaceous perennial. 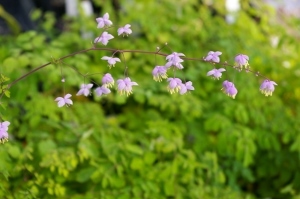 Thalictrum delavayi prefers a moist area. Midsummer to early autumn. 4 ft. x 24 in.